A team of Swiss researchers set out to evaluate the serologic response of dogs to vaccination with to Nobivac L4, and to determine whether clinical signs or changes in hematology, blood biochemistry, or echocardiography occurred after vaccination. Nobivac L4, a novel tetravalent Leptospira vaccine manufactured by Merck Animal Health, is well tolerated and produces variable seroconversion, according to a study recently published in BMC Veterinary Research. This was the first independent study to evaluate this vaccine. In recent years, researchers have documented a troubling increase in canine leptospirosis incidence in Europe among dogs receiving the bivalent Leptospira vaccine. This vaccine contains serovars from the Canicola and Icterohaemorrhagiae serogroups, which were once thought to be the primary serogroups causing canine leptospirosis. Recent seroepidemiologic studies, though, have reported additional Leptospira serogroups of veterinary importance. Canine leptospirosis is most commonly diagnosed with the microagglutination test (MAT), in which a patient’s sera is serially diluted with live leptospires in microtiter plates. MAT interpretation, however, can be made difficult by cross-reactivity among serovars, positive postvaccination titers, and previous Leptospira exposure. The tetravalent vaccine Nobivac L4, licensed in Europe in 2012, contains antigens from serovars within the Canicola, Icterohaemorrhagiae, Australis, and Grippotyphosa serogroups. With increased antigenicity in this vaccine, concerns have been raised regarding increased vaccine-associated adverse events, including acute myocarditis and heart murmurs. To date, the clinical and serologic responses to Nobivac L4 have not been evaluated. 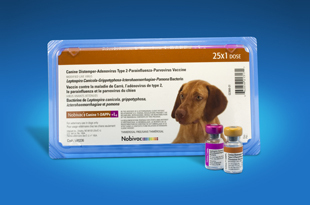 Forty-eight dogs received 2 Nobivac L4 vaccinations 3 to 4 weeks apart at time points T0 and T1; several dogs also received additional vaccine components (distemper, parvovirus, parainfluenza) to mimic real-world Nobivac L4 administration. Dogs were clinically examined at each of the study’s time points: T0, T1, T2 (6 to 8 weeks after first vaccination), and T3 (1-year booster). For the T0 and T2 procedures, blood was drawn before vaccine administration. Serum MAT titers of 100 or higher indicated seropositivity. Clinical signs occurring within 5 days of vaccination were considered adverse events. Seroconversion was highly variable within dogs and vaccine serovars. At T0, half of the dogs had a positive Canicola serovar titer, potentially indicating prior natural exposure. At T2, high titers were observed in several serovars, including Canicola, Australis, and Autumnalis. Interestingly, Autumnalis was a nonvaccine serovar, likely indicating cross-reactivity among Leptospira serovars. At T3, most titers were below the seropositive threshold. Routine blood work and serum cTroponin I levels did not vary significantly between T0 and T2. Notably, serum cTroponin I levels were largely undetectable at T0 and T2, indicating an unlikelihood of clinically important myocarditis with Nobivac L4 vaccination. In addition, no echocardiographic abnormalities were observed. Adverse events, including local injection site reaction and lethargy, were reported in 23% of dogs after the first vaccination and in 10% of dogs after the second vaccination; these events were primarily mild and transient. Whether a dog received additional vaccine components did not significantly influence adverse event frequency.